An extremely accurate drawn reference to the human body in motion. The drawings are over-muscled for easy visibility. and especially recommend it if you have some trouble with hands. 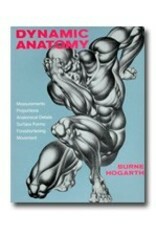 Though Mr. Hogarth died only a few years ago, this text illustrates the relevant muscle groups in his inimitable style. Unlike some anatomy books, this doesn't have skeletal references which most art schools would instruct as the basis of figure drawing. 232pp.